Why do you need an experienced Columbia Personal Injury Lawyers? Your personal injury case is about more than the accident itself. It is also about compensation after the accident or injury. The best experts agree that having an experienced personal injury lawyer can enhance the value of your case. As your Columbia personal injury attorneys, you can depend not just on our knowledge and understanding of the law, our resources, and our proven ability to secure positive results in personal injury cases. You can depend upon our commitment to telling your story and to securing fair compensation for all the ways you have been affected, and will continue to be affected, in the future. The Personal Injury attorneys and support staff at the Strom Law Firm, L.L.C. have experience dealing with incidents and can help ensure you receive fair compensation for all your personal injuries; current and future. Even those cases which do not involve life altering personal injuries or complex legal questions are often defended aggressively by insurance companies. The insurance companies who most often defend at-fault drivers spend millions of dollars teaching their adjusters how to successfully deny claims. The most important thing that you can do immediately following an accident is focus on getting better. 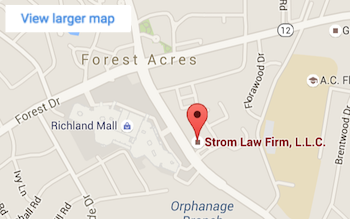 Leave the rest to Strom Law Firm Personal Injury Lawyers. What type of Compensation Can I Expect in My Personal Injury Case? pain and suffering/loss of enjoyment of life. The law in South Carolina recognizes that the quality of life of the spouse of an injured person also suffers, and it allows personal injury recovery for this injury even though the spouse did not suffer physical injury himself or herself. A loss of consortium case is separate from the injured victim’s case. A personal injury plaintiff may be entitled to a legal award of the costs for future medical care for permanent injuries. Typically, this must be proven with expert testimony. Most states including South Carolina allow additional personal injury recovery when an injury interferes with a plaintiff’s ability to lead a normal life. With an elderly personal injury client, this could mean the ability to play with one’s grandchildren, to walk and exercise as one did prior to an injury, to communicate meaningfully with others, or to engage in pastimes one previously enjoyed. A patient who was injured as a result of the medical malpractice may be entitled to recover his or her lost wages, past and future, incurred as a result of the malpractice. In a personal injury case, an injured person may be entitled to recover the costs of treatment for injuries as a result of the negligence or intentional conduct of a third party. Pain and suffering is the term used for damages designed to compensate someone for his or her personal injuries that are physical and emotional in nature. Experienced Personal Injury Lawyers may be able to add to the settlement compensation a victim can receive for out of pocket damages like lost wages and medical bills. South Carolina Courts generally do not recognize shortened life expectancy as a separate personal injury, but it may be considered in determining the seriousness of someone’s injury, decreased earning capacity, pain and suffering, and mental suffering from knowing one’s life will be shorter. South Carolina Jurors are typically told to determine a plaintiff’s future damages based on standard life expectancy tables. However, due to improvements in medical science and living conditions over the years, your Personal Injury Lawyers might argue that your life expectancy was/is actually greater than the standard tables would indicate, thereby entitling you to greater damages and better results. If you have followed good health practices, such as not smoking, exercising, maintaining a good weight, and eating properly, this information might help your Strom Law Firm LLC Personal Injury Lawyers in arguing that you are entitled to greater damages due to your longer life expectancy. Depending upon the nature of the case, punitive damages may be awarded. For example, in a case where it is shown that a nursing home engaged in malicious or reckless conduct, punitive damages may be awarded. Because injured nursing home residents are generally older, in poor health, and have a relatively short life expectancy, damage elements that are common in other personal injury cases, such as lost earning capacity, future pain and suffering, and future medical expenses, will not be as significant. Awards against nursing homes are comprised for the most part of punitive damages, and damages for mental anguish, pain and suffering experienced by the injured person, medical expenses, and the loss of affection and companionship by the surviving spouse or children. At the Strom Law Firm, we pride ourselves on our ability to be there for our clients, 24/7 when tragedy or questions arise. Every single one of our clients has access to their assigned lawyer. We encourage our clients to call us at 803-252-4800, whenever the need arises, to get help. Many consider us a part of their family – because we do everything in our power to help solve the problems your facing. In the past, our Columbia based personal injury lawyers have helped clients get medical assistance, help with car repairs, and more. Our goal is to help handle all aspects related to your case, so that you can focus on healing and your family. Our personal injury attorneys are skilled in dealing with the various obstacles that arise during the course of your case.